Standing up is something most of us take for granted; we've been doing it since childhood. Our bodies automatically adjust to the pull of gravity by increasing vascular tone, heart rate, and cardiac output. Blood vessels contract, heart rates increase and our systolic blood pressure remains the same or decreases slightly while diastolic pressure increases slightly (Brunner & Suddarth, 2000, p. 546). Our bodies operate in perfect homeostasis and we stand up with little effort. However, the simple act of standing up can be a challenge for some people. There are disorders that affect the body's ability to appropriately adjust to the pull of gravity. When the body cannot effectively adjust to upright posture, a person is said to have orthostatic intolerance. Postural orthostatic tachycardia syndrome (POTS) is a disorder characterized by orthostatic intolerance. POTS is a disorder that is a part of the dysautonomia family of disorders. While the hallmark of POTS is an excessive heart rate increment upon standing, patients often exhibit numerous symptoms of autonomic nervous system dysregulation, and research by the Mayo Clinic suggests POTS is a limited autonomic neuropathy (Thieben, Sandroni, Sletten, Benrud-Larson, Fealey, Vernino, Lennon, Shen & Low, 2007). Many POTS symptoms seem to be caused by an imbalance of the Autonomic Nervous System's (ANS) control over blood flow. It is the autonomic nervous system (ANS) that regulates the needed adjustments in vascular tone, heart rate and blood pressure upon standing. Some of the messages coming from the autonomic nervous system tell the blood vessels to relax or tighten. In people with POTS, the system seems to be out of balance and blood is not going to the right place at the right time to do what the body needs (Fischer, 2007). The autonomic nervous system is responsible for regulating a multitude of organs and functions throughout the body. Some of these functions include temperature, respiration, pupil dilation and constriction, salivation and the digestive tract. A patient experiencing ANS dysregulation may experience abnormalities in the many organs and functions the ANS regulates. For example, around one third to one-half of POTS patients have digestive troubles (Fischer, 2007). The problem is that blood flow is not matching the need, so blood is not going to the right part of the intestinal system when it needs to. As a result, these people have trouble with nausea. For a smaller percentage of patients, the trouble is that there is too much blood in parts of the intestines. The body is attempting to digest food when there is no food to digest. This leads to cramping and colicky-like pains (Fischer, 2007). POTS can be categorized as primary, meaning it is idiopathic and not associated with other diseases, or secondary, meaning it is associated with a known disease or disorder (Grubb, Kanjwal & Kosinski, 2006). Common comorbidities include chronic fatigue syndrome, hypermobility type of Ehlers-Danlos syndrome, migraine, bowel irregularities, autoimmune disorders, and fibromyalgia(Garland et al., 2015). People generally develop POTS after becoming sick with a virus, giving birth, or being exposed to great bodily stressors (i.e. surgery, trauma or chemotherapy). Some people have had POTS their entire lives. Teenagers sometimes develop the disorder during the years of rapid growth, and 75-80% of them can look forward to being asymptomatic when they reach adulthood (Grubb, Kanjwal & Kosinski, 2006). The symptoms of POTS are life-altering and debilitating at times. POTS patients use about three times more energy to stand than a healthy person (Grubb, 2002). It is as if these patients are running in place all the time. Activities such as housework, bathing, and even meals can exacerbate symptoms (Grubb, Kanjwal & Kosinski, 2006). Research shows that POTS patients' quality of life is similar to those with congestive heart failure and chronic obstructive pulmonary disease (Benrud-Larson, Dewar, Sandroni, Rummans, Haythornthwaite & Low, 2002) Twenty-five percent of people with POTS are disabled and unable to work (Goldstein, Robertson, Esler, Straus, & Eisenhofer, 2002). Most patients will have to make some lifestyle adjustments to cope with this disorder. It was once estimated that nearly 500,000 Americans had POTS, which made standing up a challenge (Robertson, 1999). However, with research advances and growing physician education, the number of people found to have POTS symptoms is steadily rising. It is now estimated that one out of every hundred teens has POTS (Fischer, 2007). POTS has a strong female predominance (4–5:1), and primarily affects women of childbearing age. 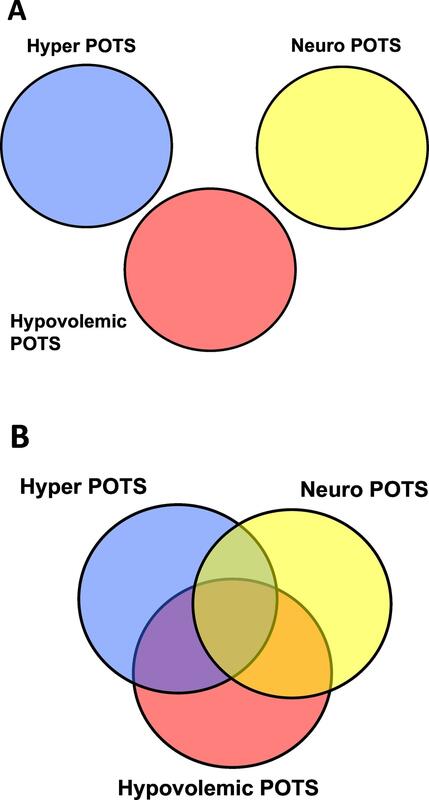 Most patients present with POTS between 13 and 50 years of age, with a family history of orthostatic intolerance reported in approximately 13% of patients (Thieben et al., 2007).The onset can be sudden or gradual. The quantity and severity of symptoms vary from day to day. There are treatments for POTS symptoms which can be tailored to each individual patient, especially if an underlying cause is discovered. Researchers are attempting to identify and treat the mechanisms and causes of POTS. Studies show that most patients will eventually be able to stand up with fewer symptoms (Low, 2000). Most people with POTS can look forward to experiencing improvement with proper treatment. For more information on POTS, please view our other POTS links and resources. 5. Goldstein, D., Robertson, D., Esler, M., Straus, S., & Eisenhofer, G. (2002). tachycardia syndrome: A concise guide to diagnosis and management. J Cardiovasc Electrophysiol., 17, 108-112. Understanding why people faint and what can be done about it. New York: Futura Publishing Company. Mayo Clinic experience. Mayo Clin. Proc. 82, (3), 308-313.